The director of the high school’s major production admits she’s been running on stress and not much else. “Everyone has been keeping me sane,” Vicky Hynes, said. “It’s been very stressful but I’ve loved it all. The production of Meant To Be opens tonight and closes on Saturday. Yesterday’s final dress rehearsal was also the chance to give primary school pupils a sneak preview of what Vicky describes as an “exciting action-packed show”. “There’s lots of singing and dancing and a lovely high school romance as well,” she said. Vicky said the pupils have taken ownership of the show and because of their own personalities, the show is something unique and special. “This is the first theatrical opportunity for many of them and they’ve risen to the occasion really well. And yes, the butterflies have taken flight Vicky admits. “They’re flapping away at the moment and it’s the same for the performers, but in true theatrical fashion, we’ll be fine on the night,” she said. 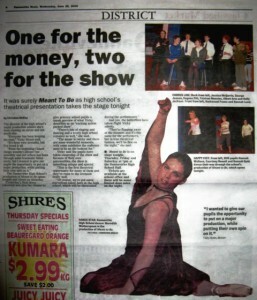 True love triumphed over all in Dannevirke High School’s production of the musical Meant to Be. With the high school cast being mainly novices who had never appeared on stage before, director Vicky Hynes said she was pleased with the way everybody had pulled together. Not even a last-minute reshuffle of cast members could put the show off its stride. In a twist on the usual Romeo and Juliet theme of star-crossed lovers finding true love against family opposition, teachers Tom Nyktos and Megan Andrews find love in the school staffroom, but it is their children, Michelle Nyktos and Adam Andrews, who are against the match. Michelle and Adam have a thing of their own going and after their friend, Warren, a self-styled legal whiz convinces them that if their respective parents get together, they would become brother and sister, and hence not able to marry, they decide to try and scuttle their parents’ romance. “Even though we are going to be living in the same household, I’m still going to miss you,” Adam tells Michelle. Tom and Michelle are newcomers to Earlswood School, supposedly one of the leading schools in the country. In the original script written for an Australian audience, the pair come to Melbourne from the backblocks. 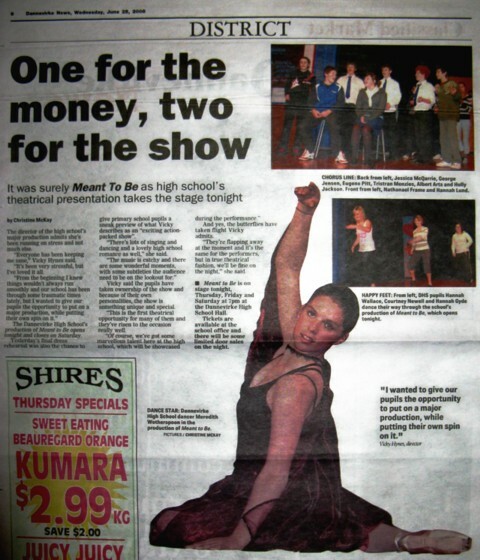 Miss Hynes said she had been in touch with the work’s Australian writer, who had given them the go-ahead to change the story to a New Zealand setting, so that Tom and Michelle came from Eketahuna to Wellington. Having a high school setting made it easier to put the production together, and the cast members had a good chemistry on stage. The choreography and music were excellent, with the Hannah Wallace dancers adding their own brand of colour. Cast members moved well together with the “love at first sight” scene between Michelle and Adam being reminiscent of the Summer Nights scene in Grease. CW gave the kind of singing and acting performance with which local audiences are now familiar, while HL showed that she is not far behind and looks set to go further still. The male band members, Adam, Warren, Nic, Ross and Jon had a good chemistry on stage. In the story, true love does win out, with the final scene being the parents’ wedding, with other romances among the cast’s characters developing along the way.